Natural gas markets are receiving a jolt from the wave of icy weather that has swept over the Eastern half of the United States. The effect is twofold: extreme cold is actually cutting production, while demand is surging because everyone is turning up the thermostat to stay warm. First the supply side. There are reports that in North Dakota’s Bakken, for instance, cold weather is cutting into production. Reuters reports that gas output in the Bakken is down more than 20 percent since last month. Citing Genscape data, Reuters said that gas flowing through interstate pipelines from North Dakota dropped from 1.3 billion cubic feet per day (bcf/d) in the week ending on December 25 to just 1 bcf/d as of Tuesday. Some of that decline could be consumed within North Dakota, but the drop-off is probably too significant not to be related to production problems. “That drop is due to the freeze off we’re seeing,” said Andrew Bradford of BTU Analytics, according to Reuters. Texas (-20 percent) Oklahoma (-22 percent) and Pennsylvania (-5 percent) are also reporting weather-related production problems, Genscape data says. Gas output can be affected by water and water vapor freezing. With temperatures in North Dakota recently dipping to -45F (-43C), it is no surprise there have been issues. On the demand side of the ledger, the U.S. is now burning through much more gas because of the cold snap. There is a structural issue and a seasonal one. The U.S. has built a long line of new gas-fired power plants in recent years to burn cheap natural gas, which has catapulted natural gas into the top spot for electricity generation. So while gas consumption fluctuates seasonally, the spring and autumn lows are getting higher and the winter spikes are also getting higher. This is a structural increase that will continue to grow over time. However, the recent jump in consumption is also the result of the extreme cold that has swept over the country. Bloomberg noted that on New Year’s Day, the U.S. burned the most natural gas ever recorded. The U.S. consumed 143 bcf of natural gas on January 1, breaking the previous record of 142 bcf during the polar vortex in 2014. With supply disruptions and record consumption occurring simultaneously, why are natural gas prices not spiking? Well, in some places they are. As mentioned above, Alberta saw a significant price increase because of the weather. In New England, where there are pipeline constraints, prices are soaring. The FT reports, citing data from S&P Global Platts, that natural gas prices just outside of Boston jumped to nearly $25/MMBtu in December. Nationally, the extreme cold could take a bite out of what has been ample storage. 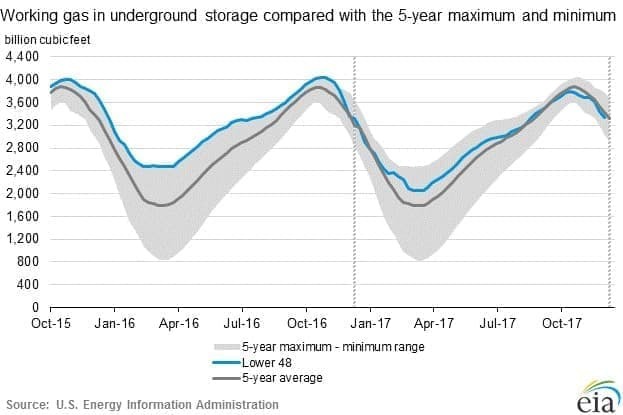 "We could consume upwards of a quarter of the stored natural gas just this month," John Kilduff of Again Capital told CNBC. A year ago, natural gas inventories in the U.S. were well above the five-year average. But things have tightened significantly in recent months, and the current cold snap could drain stocks even further. "Things could start to get tight for sure. Even if we have a normally cold winter, things get tight," Kilduff said. "These are big demand numbers we're seeing. Monday was a record. I think Saturday could eclipse Monday's record." But, judging by Nymex prices, natural gas markets remain sanguine about the challenges ahead, despite regional problems. Front-month prices are still hovering at about $3/MMBtu, roughly where they have been for the better part of a year. In fact, the bout of cold weather may only have a limited impact on the gas markets. The supply outages will be temporary, and so will the demand spike. As temperatures rise, things will go back to normal. Moreover, most analysts see the natural gas industry continuing to ramp up production. Frozen wells, another reason to build nuclear plants and large dams. Atomic nuclei and gravity always work.